Home / Clear reflection / Definitions of corporate social responsibility - What is CSR? Definitions of corporate social responsibility - What is CSR? Corporate social responsibility (CSR) is how companies manage their business processes to produce an overall positive impact on society. It covers sustainability, social impact and ethics, and done correctly should be about core business - how companies make their money - not just add-on extras such as philanthropy. 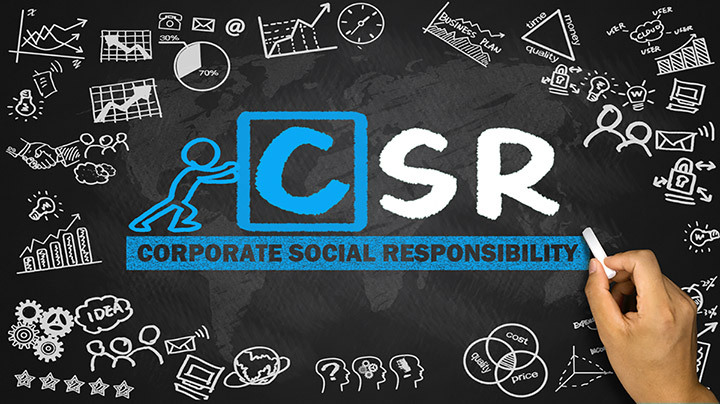 One of the most frequently asked questions at this site - and probably for all those individuals and organisations dealing with CSR issues is the obvious - just what does 'Corporate Social Responsibility' mean anyway? Is it a stalking horse for an anti-corporate agenda? Something which, like original sin, you can never escape? Or what? Different organisations have framed different definitions - although there is considerable common ground between them. My own definition is that CSR is about how companies manage the business processes to produce an overall positive impact on society . Companies need to answer to two aspects of their operations. 1. The quality of their management - both in terms of people and processes (the inner circle). 2. The nature of, and quantity of their impact on society in the various areas. Outside stakeholders are taking an increasing interest in the activity of the company. 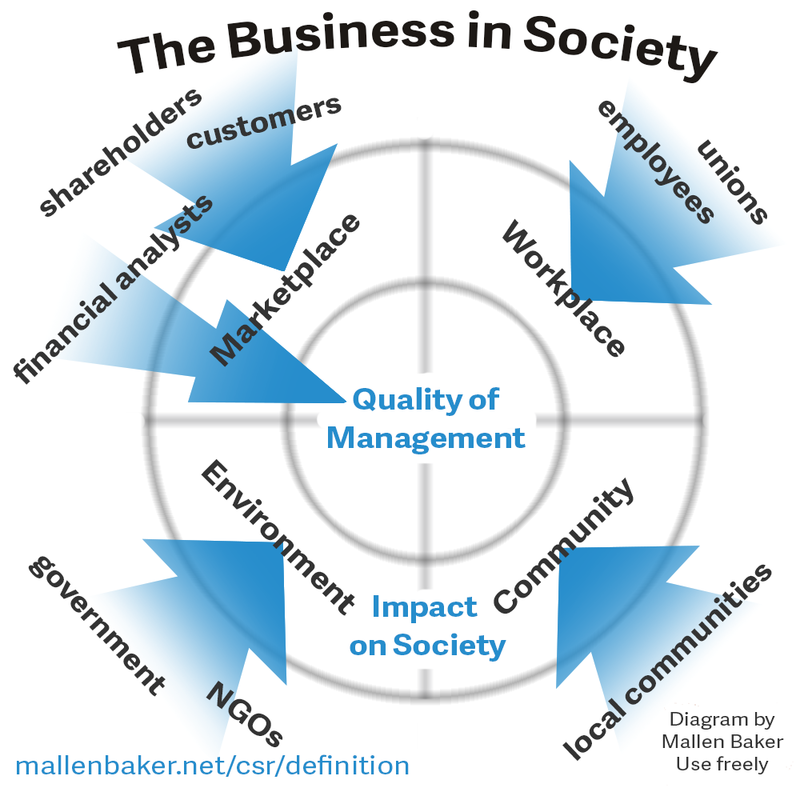 Most look to the outer circle - what the company has actually done, good or bad, in terms of its products and services, in terms of its impact on the environment and on local communities, or in how it treats and develops its workforce. Out of the various stakeholders, it is financial analysts who are predominantly focused - as well as past financial performance - on quality of management as an indicator of likely future performance. The same report gave some evidence of the different perceptions of what this should mean from a number of different societies across the world. Definitions as different as CSR is about capacity building for sustainable livelihoods. It respects cultural differences and finds the business opportunities in building the skills of employees, the community and the government from Ghana, through to CSR is about business giving back to society from the Phillipines. Traditionally in the United States, CSR has been defined much more in terms of a philanphropic model. Companies make profits, unhindered except by fulfilling their duty to pay taxes. Then they donate a certain share of the profits to charitable causes. It is seen as tainting the act for the company to receive any benefit from the giving. But as with any process based on the collective activities of communities of human beings (as companies are) there is no 'one size fits all'. In different countries, there will be different priorities, and values that will shape how business act. And even the observations above are changing over time. The US has growing numbers of people looking towards core business issues. When you review each of these, they broadly agree that the definition now focuses on the impact of how you manage your core business. Some go further than others in prescribing how far companies go beyond managing their own impact into the terrain of acting specifically outside of that focus to make a contribution to the achievement of broader societal goals. It is a key difference, when many business leaders feel that their companies are ill equipped to pursue broaders societal goals, and activists argue that companies have no democratic legitimacy to take such roles. That particular debate will continue. Love food and want it to be sustainable? Check out my other blog Delicious and Sustainable.